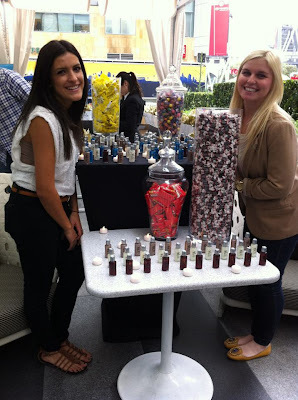 On November 18, 2011 Tuff Scent nail polish was in LA for the American Music Awards! They had a booth in the 102.7 KIIS FM Gifting Suite! How exciting is that? They were there to promote their awesome scented nail polishes to attendees of the event. The shades they were gifting at the event were: Kiss (previously reviewed here on my blog! ), Wish, Mother Nature, and Laughter. Laughter is a shimmery deep red/burgundy colored polish. It's got the scent of blackberry and applies nicely in 2 coats. This is one of the colors in the Fire Collection. The quote on the back of Laughter's bottle is "The ultimate prescription for nurturing and healing". Mother Nature is a frosty light teal with a subtle shimmer. It's got a fresh spearmint scent, which I loved! This gorgeous color is part of the Water Collection. The quote for Mother Nature is: "Reminds us to care and give back, to nurture, change and grow with kindness towards all"
Lastly we have Wish, from the Mineral Collection. This is definitely my favorite of the group because it's glitter, and as you all know by now, I have a weakness for a good glitter...this one does not disappoint! It was definitely best for layering, so I tried it out over the other two polishes and it looks amazing over either. I am very fond of it over Mother Nature! It looks like ice! Perfect for Winter! The quote we find on Wish's bottle is: "Always, forever and until eternity, the soul’s secret ingredient". All in all, once again, I am pleased with these Tuff Scent polishes. I am still getting used to using their brushes, as the bottles are taller and therefore the brushes are longer, so that you can reach the bottom of the bottle. It is not hard to do, but is just very different from most of the other polish applicators I have used. I really like the Mother Nature, it's such a pretty shade. I love these colors! so sparkly!